Most of the Soviet filmmakers who pioneered the cinema during the 1920s – such as Pudovkin, Kuleshov, Eisenstein – were, for various reasons, largely inactive after WWII. The Soviet people lived under conditions of wartime stringency well into the 1950s. During this time, Party leaders exercised political repressions that led to captured soldiers, refugees, religious believers, and political prisoners filling the labor camps. After Stalin’s death in 1953, Nikita Khrushchev took over the leadership of the Soviet state. He attacked Stalin’s dictatorial policies and denounced everything that glorified the ‘cult of personality’ he promoted. In the course of five years – a period that has become known as the ‘Thaw,’ from 1953 to 1958 – the party undertook numerous reforms, such as freeing thousands of prisoners from the labor camps and investing government funds into education and research. These reforms also affected the film industry, which had been, up until then, under the strict censorship control by the policy of Social Realism. The latter policy required artists to produce art that glorified the party leaders’ heroism, as well as the patriotism of the common man. As a result of these changes, some of the most significant and innovative Soviet films were produced in this decade – films that presented a humane side of WWII and its effect on people living through the most incredible hardships. Ballad of a Soldier, directed by Grigori Chukhrai, is one such film. Devoid of Communist preaching, the film’s opening scene informs us that we are going to learn a story of a Russian soldier, a fine man who was one of many who died in the war. That soldier is 19-year old Alyosha (Vladimir Ivashov), who came from a small village where the one main road will take you everywhere. It was on that road Alyosha and his mother (Antonina Maksimova) gave each other their last embrace. Since Chukhrai has opened the film by telling us that Alyosha eventually didn’t come back from the war, their farewell meeting becomes particularly poignant to watch. We meet Alyosha for the first time on a battlefield in the middle of a sweaty terror. The technical finesse of the film, especially in its battle scene – for example, a deep focus shot flips up, slowly turning upside-down and then just freezes there – is particularly suitable for conveying a feeling of disorientation and loss. For Alyosha, whose infantry nickname, Finch, suits him so tenderly, this must have been his first real battle (in which he loses a partner and, almost accidentally, knocks out two Nazi tanks). He then declines a decoration he earned for his haphazard heroism and instead bargains a weeklong vacation to visit his mother. Time is everything. The war continues on all fronts and Alexei arrives home so late he barely has time to embrace his mother before he must rush back to fulfill his duty. In the course of the trip back to his mother, the young soldier witnesses a Russia ravaged by war, famine and destruction. He faces a country turned upside-down. Alyosha’s long-legged, lanky figure is still boyishly awkward, yet also quick and charming. He is naïve but not foolish, kind and inquisitively sensitive about people around him. A guy he meets at a train station, Vasya, lost his leg in the war and is contemplating not returning to his wife. An invalid, he is fearful of her disdain. Yevgeni Urbansky, a wonderful actor whose cinematic fame was as sudden as it was short-lived, plays the role. (A year later Urbansky was cast in another Chukhrai film, Clear Skies , a story of a Soviet pilot who survived Nazi imprisonment and was later accused of being a spy.) Persuaded by Alexei, Vasya returns to his hometown. The suspense becomes almost unbearable while the two of them wait for Vasya’s wife (Elza Lezhdey) at a train station. It looks like she will never come – yet she does, and the two reunite nervously in a sweet embrace, walking down the platform without being able to hold each other’s hands. Moments like this fill the screen with an indelible power – a simple and poetic legacy that has given Ballad of a Soldier its historic longevity. Ballad of a Soldier is a simple film that displays conventional patriotism, a glorification of paternal leaders still very typical for the films of the period. In a sincere and sometimes naïve way, the director embraces the camaraderie of the people and the ties of misfortune that keeps them together. At times, their commiseration is almost larger than life: no matter what hardships Alexei has to endure, he keeps the word he has given to his fellow soldiers, his mother, and even people he meets through incidental, fleeting encounters. In keeping with this, the general of Alyosha’s battalion is a generous big-hearted man, a lorry driver goes out of his way to help Alyosha get home, and the lieutenant, ‘a Terrible Beast’ (Teterin), lets him on the non-passenger train and turns his bestial side not to him but to the train guard – for taking bribes. The ‘Thaw’ poetics are particularly evident in the treatment of Alyosha’s sexual longing, something that would have never been represented during Stalin’s era. Human sexuality, and its most subtle and most expressive manifestations, had been a forbidden subject for Soviet cinema. Alyosha meets a refugee girl, Shura (Zhanna Prokhorenko), when she sneaks into the echelon. Aloysha hides behind a haystack and watches her fixing up her stockings – an incredibly daring gesture, and very telling of Alexei’s intentions. The connection between them, a fleeting moment of mutual attraction, is eloquently expressed in the way Shura’s radiant eyes meet Alyosha’s wide-eyed, mesmerizing gaze, and how his hungry look searches her face when she greedily drinks water. The post-war generation welcomed such sights of youthful sensuality and passion on the screen, even if only in the context of official doctrine and within a well-established genre. Ballad of a Soldier was called “Socialist Realism with a human face” for its ability to move beyond the puritanism of previous filmic generations. It is interesting to note that in his previous film, The Forty-First (1956), Chukhrai explores a developing sexual relationship between a female soldier and her prisoner. 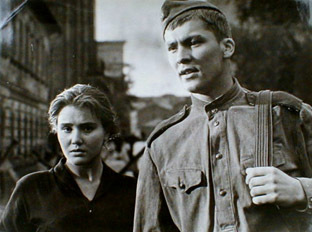 Both Ballad of Soldier and another film from the same period, the legendary The Cranes Are Flying (Mikhail Kalatozov, 1957), which won the Grand Prize at the 1958 Cannes Film Festival, portray complex psychological conflicts that had been regarded as bourgeois and decadent in the Soviet society of the 1940s and early 1950s. Even though the ‘Thaw’ soon ended, Soviet cinema was rehabilitated in the eyes of the international film community.